Cute Card Thursday's challenge for this week is "Letters and Numbers". I took my chance to make a card for a friend's highschool degree. 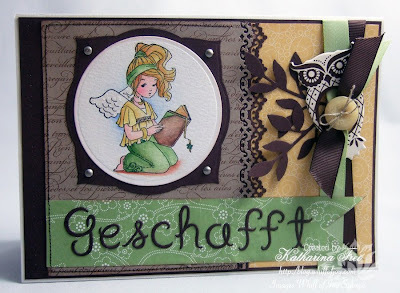 Cute Card Thursday's challenge dieser Woche ist "Buchstaben und Zahlen". Ich habe die Chance genutzt und für eine Bekannte eine Glückwunschkarte zur Matura gemacht. I stamped the script wording with a Stampin' Up background stamp "En Francais" with chocolate chip ink on kraft cardstock. The large sentiment is cut with the Cuttlebug alphabet "Fancy Pants" and means "You made it!" in german. 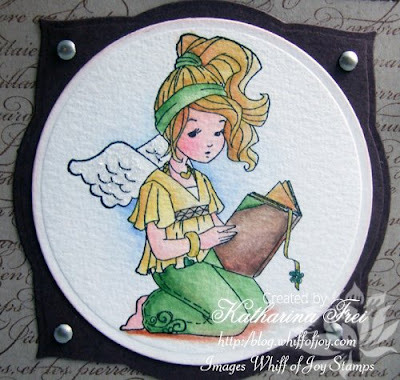 I coloured the beautiful Whiff of Joy / Elisabeth Bell angel with water soluble pens and Twinkling H2Os. Ich habe mit einem Stampin' Up Hintergrundstempel "En Francais" und brauner Tinte auf Kraft Cardstock gestempelt. Den großen Text habe ich mit dem Cuttlebug Alphabet "Fancy Pants" ausgestanzt. Den wunderschönen Whiff of Joy / Elisabeth Bell Engel habe ich mit Aquarellstiften und Twinkling H2Os coloriert. I did the borders with a Fiskars border punch. The leaves are a SU Sizzit die and the chipboard owl is from Tattered Angel (Glimmer Chips). Die Kante habe ich mit einem Fiskars Border Stanzer gemacht. Die Blätter sind ein SU Sizzit Die und die Eule aus Karton, selbstklebend von der Firma "Tattered Angels" (Glimmer Chips). Ich habe auch das Innere der Karte dekoriert, und zwar mit Melinda's Büchern und einem Text der deutschen Party und Geburtstagstexte von WoJ. 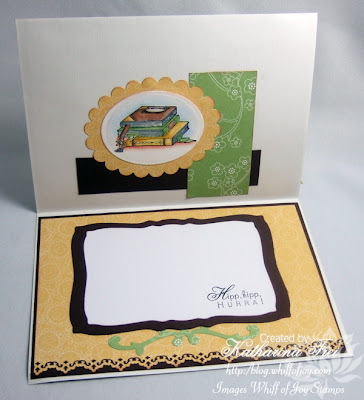 The text can be written on the white cardstock which I cut with Spellbinder's curved rectangle Nestabilities. The swirl below it is from a Spellbinder's die called "Floral Accents". Den weissen Cardstock auf den man den Text schreiben kann habe ich mit Spellbinder's curved rectangle Nestabilities ausgestanzt. Der Schnörkel darunter ist von einem Spellbinder's Die, das "Floral Accents" heißt. Stunning card. Love how you carried the design to the inside. I adore that stamp..another one on my wish list. This is simply stunning Katharina, love it. what a super lovely card katharina! Ohhh wowwww Katharina,what a beautiful card,l love the image and colours. This is wonderful! Your projects are always so impressive, thank you for inspiring me and sharing! Superschöne Karte!Es gefällt mir sehr gut wie du sie innen gestaltet hast!Die Eule ist supersüß. Love the colours and the addition of the owl is a stroke of genius! Fab card, love those colours together and the inside too. just beautiful Katharina! So love the fabulous image and the owl is adorable! Beautiful card, Katharina! 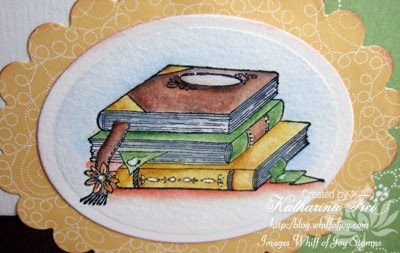 This is one of my favorite WOJ stamps, along with the stack of books, because I love books! Your coloring is perfection and the whole layout is lovely! What a wonderful keepsake of graduation. 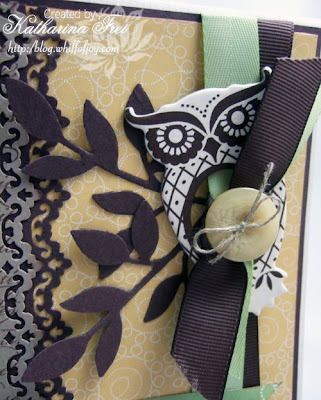 Beautifull card, I love how you used the owl! I just love the colour scheme. What did you use to make leaves? Sieht die schön aus! Da passt mal wieder alles. Absolut. Besonders schön finde ich auch die Eule, die ja ein Symbol für Weisheit ist. Das passt natürlich zum Anlass der Karte, besser gehts nicht!